An explosion on a Tube train in south-west London is being treated as terrorism, Scotland Yard has said. Passengers were injured following the blast at 08:20 BST (07:20 GMT) at Parsons Green station in Fulham. The Metropolitan Police said it was too early to confirm the cause of the fire and the station has been cordoned off. BBC security correspondent Frank Gardner said it was too early to say who caused the explosion. Witnesses have described seeing at least one passenger with facial injuries. Others have spoken of "panic" as alarmed passengers left the train at Parsons Green station. London Ambulance Service says it sent a hazardous area response team to the scene. 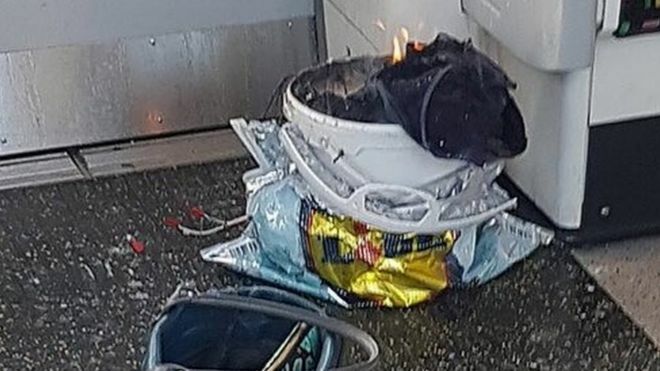 Passenger Chris Wildish told BBC Radio 5 live he saw a bucket in a supermarket bag with "low-level flames coming out of it" by the door of the rear carriage. One witness, called Luke, told 5 live there was "a sort of loud explosion". "It happened just as we were pulling up to the Tube station so everyone just sort of piled out of the Tube and there was a distinct smell of burning," he said. "I certainly saw some burning injuries," he said, but added that "everyone behaved in the right manner as such, everyone got off as quickly as they can and you know supported everyone". Emma, who was at Parsons Green station, said: "We were running down the stairs like... it felt like for our lives. "I went down the stairs and after a while people were just piling on top of each other, because people were falling over trying to run so quickly. "There were two ladies underneath me and a little boy to my right, his head had been smacked into the concrete." BBC London presenter Riz Lateef, who was at Parsons Green on her way in to work, said: "There was panic as people rushed from the train, hearing what appeared to be an explosion. BBC News presenter Sophie Raworth says she saw a woman on a stretcher with burns to her face and legs. Alex Littlefield, 24, a City worker, said: "I was walking around the corner to the Parsons Green Tube station and I saw the raised platform with everyone running and looking upset. "I saw police officers, fire brigade... masses of people and armed police. There were lots of very, very distressed people. We've been pushed right back now." Media technology consultant Richard Aylmer-Hall who was sitting on the "packed" District Line train said he saw several people injured, having apparently been trampled as they tried to escape. The 53-year-old said: "Suddenly there was panic, lots of people shouting, screaming, lots of screaming. "I saw crying women, there was lots of shouting and screaming, there was a bit of a crush on the stairs going down to the streets." Wish you Brits would listen to him and stop whining. Parsons Green terror attack: Sadiq Khan pleads for Londoners to remain calm. A second man has been arrested in connection with the terror attack at Parsons Green as it was revealed a teenager apprehended yesterday morning was allegedly arrested two weeks ago at the exact same tube station where the device exploded but released. The 21-year-old was apprehended in the London borough of Hounslow at around 11.50pm last night and has been taken to a south London police station, officers said. It comes as neighbours claim terror police have recovered '15 firearms and a bomb'from a Surrey house raided yesterday in connection with the attack. Officers are today searching the property, in Sunbury-on-Thames, after the first suspect, an 18-year-old man, was detained in Dover yesterday morning as he apparently attempted to leave the country. A second property in Sandwell is also being searched in relation to the second man's arrest in Hounslow. The teenager - who is being held after police tracked him to the departures hall of the coastal town's port - is thought to have been a 'problematic foster child' who was raised in Sunbury by Penelope Jones, 71, and husband Ronald, 88. The Joneses have raised 268 foster children in the house over three decades and the last eight have been refugees. Eight years ago the kind-hearted couple were awarded MBEs by the Queen for their services to children and families. Neighbours on the quiet street said officers had been there since Friday and claimed a teenager living at the raided property had been arrested at Parsons Green station two weeks ago but was later returned home. A search is also taking place at a residential address in Stanwell, Surrey, in connection with the Hounslow operation, although it is not known if any arrests have been made there. The arrests come after the Prime Minister announced the UK's terror threat has been raised to critical as officials fear there could be copycat attacks following Friday's bombing, which injured 30. This morning Home Secretary Amber Rudd said it appeared the bomber was not a lone wolf but added that it was 'too early to reach any final conclusions on that'. It is not known how long the foster teenager living in the Sunbury home is believed to have resided there. One neighbour has claimed it has been as long as five years while another said he was dropped off at the property just two weeks ago. The second neighbour said the man had been dropped off from a foster home in Kent and that he saw him 'ranting and raving' at Mr Jones in the garden. He said: 'I decided to go out to try and calm the situation down, I said to the lad, "they are nice people and you need to calm down". 'He was ranting and raving saying he wanted to go to London. Officers stormed the home on Cavendish Road at 2pm yesterday, around six hours after apprehending the suspect in the departure lounge of the Port of Dover. Around 60 residents on the street were told to leave their homes, while unconfirmed reports suggested 'explosives' were found in the garden and 'firearms' seen under the floorboards. One Neighbour, who identified herself as Carrie, said: 'I was speaking to a police officer and asking him what was going on and how long we would be out of our house. Close friends of pensioners Penny and Ron Jones said the couple - who are widely respected in the local area - were at 'their end' with the teenager. Serena Barber, 47, who has known the couple all her life and lives in a property backing on to theirs, said: 'They have two boys at the moment, both are foreign. One is very quiet and polite, the other who is 18 is awful. The development comes as police revealed they are 'keeping an open mind' on whether there was more than one person responsible for the bombing. The kind-hearted couple whose house in Sunbury was raided yesterday have MBEs for fostering at least 268 people over three decades. Of those children Penny and Ron Jones have taken in, at least eight were refugees coming from countries including Iraq, Eritrea, Syria, Albania and Afghanistan. One of them was a 15-year-old boy who had smuggled himself into the country from Calais in the back of a lorry after escaping his oppressive family who had imprisoned him for his beliefs. Mrs Jones, who has six children of her own with her husband, said in an interview with community group Elmbridge CAN: 'We just try and support where we can - because they’ve had bad lives. 15 firearms and a bomb found at the foster home,....i realize that the foster parents are very elderly and that might explain how/why they didn't notice the guns or the bomb. So then how do there happen to be 15 firearms in a single home then? A teenage asylum seeker set off a bomb on the Tube after coming to Britain in the back of a lorry and telling the Home Office he was trained to kill by Islamic State, a court heard yesterday. Iraqi Ahmed Hassan, 18, is accused of building a deadly explosive device, packed with 5lbs of knives, screwdrivers and nails for 'maximum carnage', at the foster home where he was given refuge. The bomb contained 14oz of the explosive TATP, commonly known as 'Mother of Satan', and sent a fireball through a District Line carriage packed with rush-hour commuters – injuring 30 – at Parsons Green station in West London on September 15 last year. He loaded his bucket bomb with shrapnel, including screwdrivers and drill bits bought from Asda and Aldi. But shortly after his arrival in the UK, Hassan was seen by staff at a shelter in Horley, Surrey, run by children's charity Barnados secretly watching a video featuring masked men with machine guns bearing an IS flag, it was said. Despite this worrying behaviour, the teenager was referred by social services to Brooklands College, where he was given a mentor who helped him find a foster home in Sunbury, Surrey.